Made from a self-fusing silicone rubber, our Quick Wrap Tape is capable of creating instant connection points for nearly any tool in a matter of seconds when used with a 3M™ DBI-SALA® D-Ring or Tool Cinch Attachment Point. Quick Wrap Tape conforms to the shape of whatever it is applied to, making it ideal for even the most irregular shaped tools. 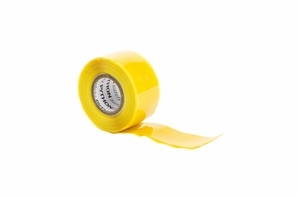 Quick Wrap Tape has a temperature range of -65°F to 500°F (-54°C to 260°C). • Leaves no adhesive residue: Quick Wrap Tape is made from a self-fusing silicone rubber that leaves no adhesive residue behind when removed. • Creates instant connection points: Quick Wrap Tape is used with 3M™ DBI-SALA® D-Rings and Tool Cinches to create instant connection points to easily tether tools.